[Left] (upper and lower) I live in the city of Higashi Osaka. It's about 15 minutes by train from downtown Osaka. 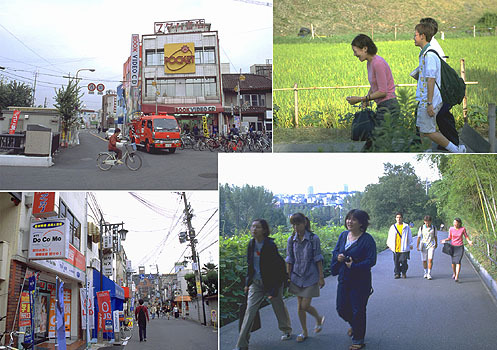 A residential area from a long time ago, it has a small station and a shopping street in front of the station. There is a lot of bicycle traffic. [Right] (upper and lower) Since junior high, I've been commuting to school in northern Osaka to a school in Senri, part of the city of Minoo, so I'm not that attached to my local community. I'm actually more familiar with the parks in the area where my school is and with the Namba entertainment/shopping district, where we often go to have fun. This is the landscape along the way from the station to the school. Our school is in the middle of a newly developed residential area, so there is still a lot of greenery. Click the photograph to view an enlarged version that can be printed on standard quality A4 paper ( 210mm x 296mm ). Please use the TJF Photo Data Bank Password. TJF Photo Data Bank.